LIFE HACKS #1318 5 THINGS YOU SHOULD KNOW BEFORE YOU FLY: 1 - ProudMummy.com the Web's Community for Mums. 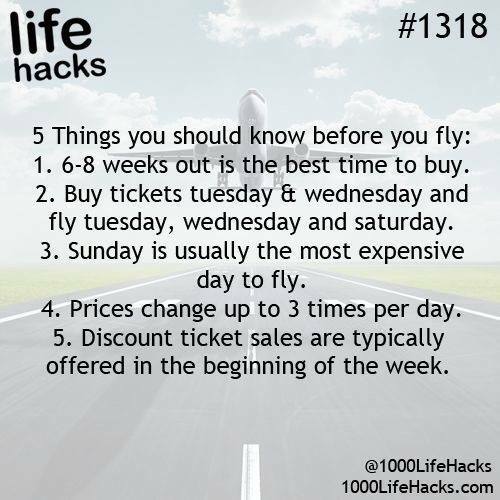 LIFE HACKS #1318 5 THINGS YOU SHOULD KNOW BEFORE YOU FLY: 1. 6-8 WEEKS OUT IS THE BEST TIME TO BUY. 2. BUY TICKETS TUESDAY & WEDNESDAY AND FLY TUESDAY, WEDNESDAY AND SATURDAY. 3. SUNDAY IS USUALLY THE MOST EXPENSIVE DAY TO FLY. 4. PRICES CHANGE UP TO 3 TIMES PER DAY. 5. DISCOUNT TICKET SALES ARE TYPICALLY OFFERED IN THE BEGINNING OF THE WEEK.